Rosh Hashanah is the Jewish New Year, celebrated on the first day of the Hebrew month of Tishrei (September or October). It is also called the Day of Remembrance or the Day of Judgement because it begins a 10-day period when Jews recall their relationship to God. Some Jewish people celebrate Rosh Hashanah for two days, and others celebrate the holiday just for one day. Like most Jewish holidays, there are food customs associated with Rosh Hashanah. 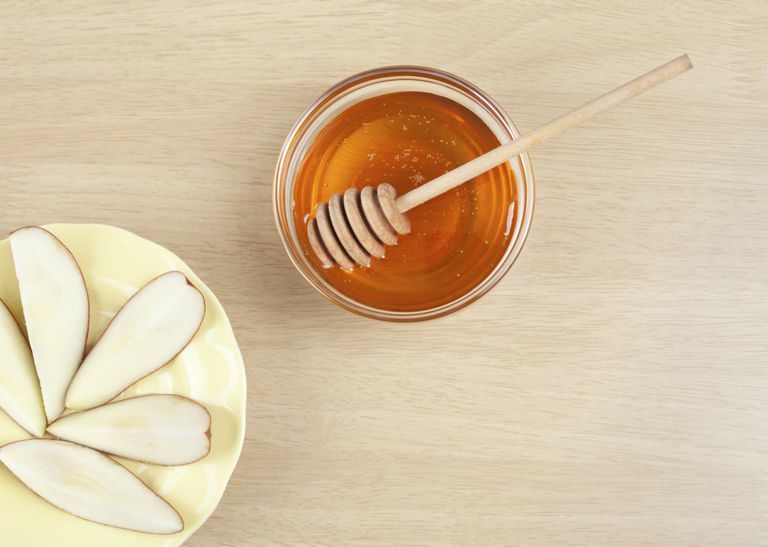 One of the most popular and well-known food customs has to do with dipping apple slices into honey. This sweet combination stems from an age-old Jewish tradition of eating sweet foods to express our hope for a sweet new year. This custom is a celebration of family time, special recipes, and sweet snacks. The custom of dipping apple slices in honey is believed to have been initiated by Ashkenazi Jews during later medieval times but is now standard practice for all observant Jews. In addition to symbolizing our hopes for a sweet new year, according to Jewish mysticism, the apple represents the Shekhinah (the feminine aspect of God). During Rosh Hashanah, some Jews believe the Shekhinah is watching us and evaluating our behavior during the previous year. Eating honey with apples represents our hope that the Shekhinah will judge us kindly and look down on us with sweetness. Beyond its association with the Shekhinah, ancient Jews thought apples had healing properties. Rabbi Alfred Koltach writes in The Second Jewish Book of Why that whenever King Herod (73-4 BCE.) felt faint, he would eat an apple; and that during Talmudic times apples were frequently sent as gifts to people in ill health. Round challah: A braided egg bread that is one of the most popular food symbols for the Jewish New Year after apples and honey. Honey cake: A sweet cake typically made with autumn spices such as cloves, cinnamon, and allspice. New fruit: A pomegranate or other fruit that has recently come into season but has not been eaten yet. Fish: The head of a fish is typically eaten during Rosh Hashanah as a symbol of fertility and abundance. What is the Tashlich Ritual?